We’ll stare at the customer mutely, searching for words. But. There are no words. Yes.The unthinkable has happened: we are speechless. Oh, Gentle Reader. I’m just joking. I’m trying to make you laugh. Did I? Or did I go over that line of decency and decorum that I dance around quite frequently? Tell me. I won’t take it too hard. Maybe. I’d never actually smack a customer, that much is true. And I certainly wouldn’t smack you. It’s just that this angel food cake . . . this cake . . . it’s just so special. It’s fluffy and white but not too fluffy, you know what I’m saying? It has got a nice chew to it, too. There’s just no possible way that it could come from a box! If you ask me really nicely, I could probably get my mom’s recipe for you. I’ve never actually made the cake myself, since Mom’s is so spectacular. She makes it, so I don’t have to. Yes, ma’am, it’s made from scratch. Other questions that drive us ’round the bend: “Do you bake all this stuff yourselves?” and “Do you make these pies from scratch?” and “How many days old is this bread?” and “Do you use canned pie filling?” Answers: Um, Yes, we make it all ourselves. Yes, of course the pies are made from scratch . . . The bread was all made this morning: I got up at 5:00. No, we don’t use canned anything. And no, we don’t use boxed mixes. We make everything from scratch, with freshly-ground flour, real butter, local honey, and other wholesome ingredients. We all learned how to do this from Mom. The only time that I remember buying food in a box was when we were camping, and then we would buy Hamburger Helper. It was a real treat, though not as good as Mom’s homemade hamburger dishes, natch. We use herbs and veg and fruit from our own gardens and orchards. 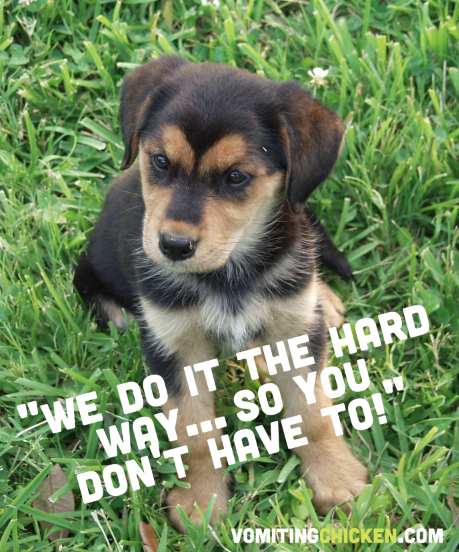 We make everything for our customers just the way we make it for our own families. I’m not bragging. Just stating the facts, ma’am. Or sir. “Basically . . . we do it the hard way . . . so you don’t have to!” That’s what I should have said to the pleasant-faced lady. Hey. That could be a great advertising slogan. The visual image would be . . . hmm . . . I don’t think there should be a visual, actually. Stacks of dirty pots and pans? A flour-dusted kitchen? A greasy mess at the end of an afternoon of frying donuts? Us dropping our dead-tired bodies into bed at the end of market day? Nahhhh . . . maybe we’ll just go with something different. Something cute and cuddly. Like a puppy, or a basket full of kittens. I’ve already used the baby gerbil photo enough times, I think. Although it is very sweet. Wow. My son Andrew does such nice work, doesn’t he? Thanks Andrew. There. That is perfect. I think that ought to be our new slogan. But actually I was going to share a bread recipe with you, wasn’t I? Do you actually read all this silly rambling that I put you through, Gentle Reader, or do you just cut to the chase—?? I’d appreciate knowing this. I would. On to the bread recipe. One of my favorite “traditional” breads that I make (i.e. non-artisan) is this Chewy, Crunchy 9-Grain Bread. It’s makes excellent toast and sandwiches. I kinda made the recipe up . . . (wait for it) . . . so you don’t have to. 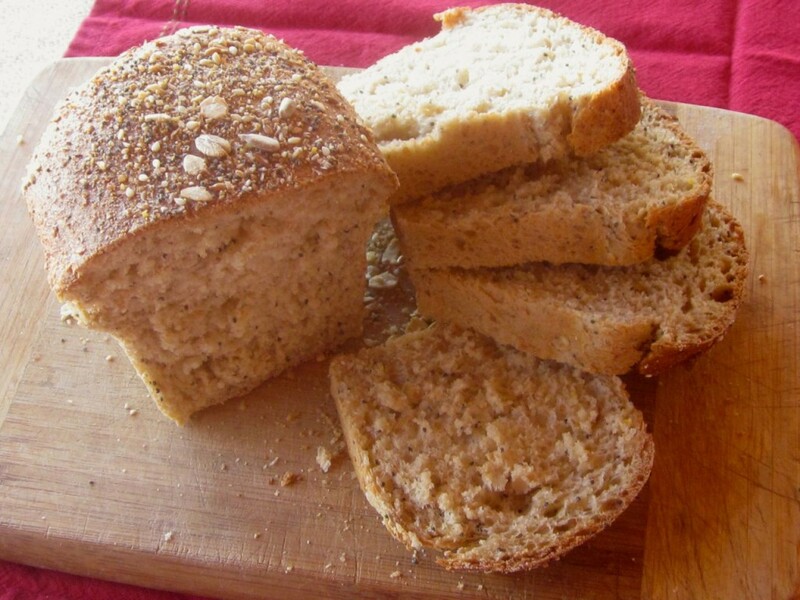 I’ve fiddled and tweaked it over the years (like my mom does) and it makes a great bread. The recipe involves a pre-step. You’ve got to first mix up a 9-grain mix, first. But then you’re good to go. Mmmm. . . chewy and crunchy and just waiting for the soft butter . . . So. Without further ado, here’s my recipe. The 9-grain mix that I use in this recipe is my own invention, and is actually a mixture of many kinds of seeds and grains, and it changes from time to time. So feel free to mix your own, according to your tastes, if you like! Then, mix 3 cups of 9-grain mix and 4 cups whole wheat flour, yeast, and water, and mix for 1 minute, in a mixer bowl equipped with a kneading arm. Turn off mixer, cover bowl, and let dough sponge for 10 minutes. Add oil, honey and salt. Mix well. Add unbleached flour 1 cup at a time, while your mixer is running, until dough cleans the side of the bowl. Knead 5 minutes with mixer. Or, knead by hand if you prefer. Get yourself a cup of coffee, say, or read the front page of the paper while your mixer does the work. Lightly oil hands. 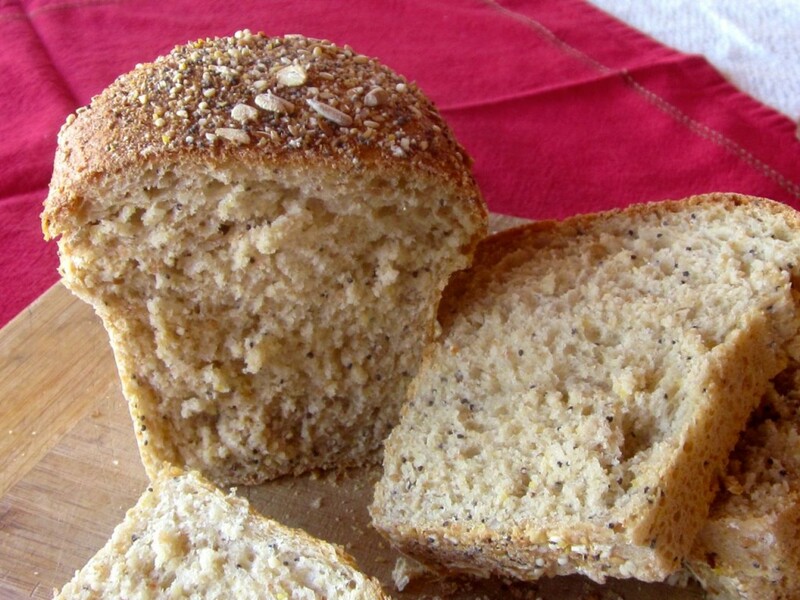 Shape into 4 large loaves, and put into greased loaf pans, sprinkled with your 9-grain mix. Let rise until double, about 30 to 40 minutes. Bake for 25 to 35 minutes until golden brown and firm on the sides and bottom. Remove from pans and cool on racks. Here’s a close-up. See that marvelous crumb? Got your bread made? Now all you have to do is make sure that your butter is soft. Enjoy your bread! Bread is one thing i have never made and always wanted to. You’ve inspired me! Carol, this recipe is a little challenging, in the fact that you have to gather up all those grains. I’d recommend going someplace where there are bulk grains and seeds (here in Nebraska, we’ve got big grocery stores and also health food stores where you can sack up your own, and save lots of $$) and make substitutions where necessary. But the bread recipe itself is easy-peasy. Good luck! I hope you make some. I nearly spewed my coffee when I read your answer to the pleasant-faced lady’s question! “There’s a smack for that kind of question. But no words,” is EXACTLY what my outrageous best friend’s answer might be. She reluctantly deals with customers for her wood pellet stove business that her husband runs. Some of the questions she gets, deserve just such answers. And, no, they don’t ‘make’ these stoves. I’m going to tell her what you said so she can add this answer to her list of saucy remarks. Btw, I read your whole post every time, just so you know. I love your rambling. I feel like I know you a bit. That’s why you’re getting an apron, because you give me “you”. Guess what??? It’s finished. I need an address and it’ll be in the mail tomorrow. Loved your’s and Rita’s comments to the “customer”. But, as for the bread- me cook, me no bake. Oh Roy. As Anne of Green Gables would say: “How much you miss!” in not baking. Try it, you’ll love it! It’s not as hard as it has been built up to be. Ha! I love the new Farmer’s Market slogan. And the picture of the puppy. I think you should have the puppy as a mascot, natch. Hope you all weren’t rained out yesterday! Call me Bethany and I’ll tell you allllll about it! We escaped being rained out by God’s grace and the skin of our teeth, and we had a terrific market, from 4:45 to about 6:30, when it started raining afresh. I hope your market today goes well, and I can’t wait to hear about it! Hilarious. I get the same thing about my hair color. “Hey, what color of dye do you use to dye your hair?.” Uh, sorry. This color doesn’t come in a box. Smack. Thanks for the recipe. I’m a recipe monger. Can’t wait to try it. Ooh…thank you for the added treat in this article making me laugh with your humor and hungry not only for the 9 grain bread but for your beautiful angel food cake. No way can a cake that looks like the one in your picture be from a box. Don’t people ask the craziest or may I say the stupidest questions? 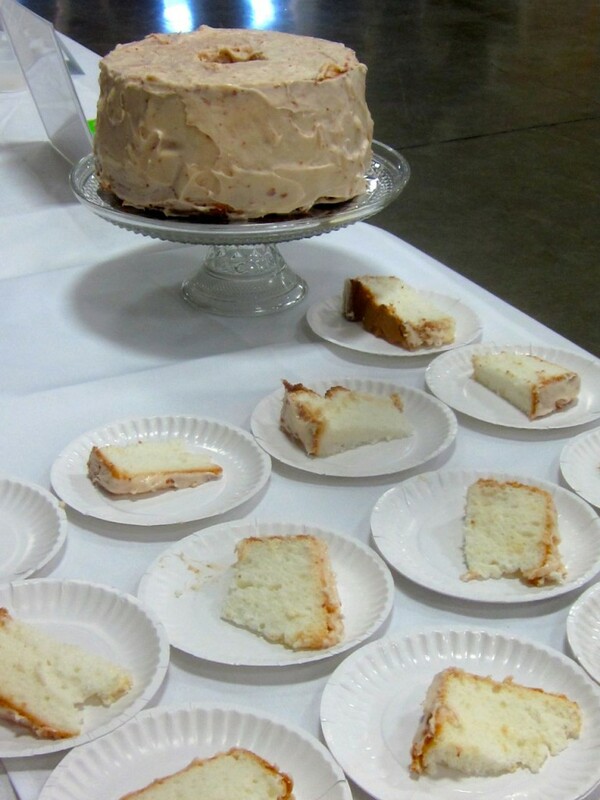 Jennifer, some things seem obvious to me, too, but I suppose plenty of folks have never seen a homemade angel food cake! I wouldn’t MISS reading a rambling, so don’t you DARE stop! Like I said in another comment “warm and fuzzy” here thanks to your ramblings. Oh, don’t you wish you could just paste a “stupid” sign on some people? OR, maybe just print up a bunch of post-its with the word “SMACK” printed on it in a lovely font. The angel food cake is gorgeous, and the description did make my mouth water. I’ll have to show the bread recipe to my my husband. He bakes all our bread, but he uses his bread machine. The breads are all “from scratch” and he has really mastered the art. Some people just dump all the ingredients into the pan, close the lid, turn on the machine and leave. My husband won’t leave until he is assured the ingredient ratio is perfect for whatever weather atmosphere is surrounding us, and he has viewed and felt the dough. For him, it really is an art form. He loves adding various seeds, grains, etc. and experimenting with the recipes. (I’ve lost count of the number of bread machine recipe books we have). Thank you, Diane! Your husband sounds very accomplished in the bread-making department. What a blessing! He also sounds like he has a fairly scientific approach. I’m impressed! Do you have a store that has a bulk foods section? Send your hubby there, and let him pick out what he likes to put in the bread. Basically any nuts and seeds and ground grains will work, although if you put in too many kinds of ground grains (cornmeal, rye flour, etc.) it will be a drier bread. I’ve put walnuts in it before–yum! You’ll get hooked on it! Just a warning! Thanks CJ *hugs* You made my day! The bread looks gorgeous! I’m not sure if I could eat it though, it might break my fixed brace! I love the fact that you make everything from scratch. You must all have a VERY healthy diet by cutting out refined sugars and processed foods! Yes, you made me laugh. Yes, I read to the end of the post. My mother always put a home cooked meal on the table, but it was the 60-70’s and there was a lot of cans, bottles and package goods in a casserole, etc. Lucky my father liked a steak and baked potato a couple times per week. I am so happy to see people starting to care where their food comes from, but there is still so many that don’t care or blindly follow the USDA guidelines. I was shocked and grossed out when I started reading about it several years ago, especially meat. So, little by little I have changed our families eating habits. My daughter is right by my side, but my husband and son are going down kicking and screaming. And thank you for inspiring me to get back to yeast bread baking. I’ve been keeping a sour dough starter alive for over 5 years and have yet to find a recipe we are actually crazy about. I borrowed Artisan Bread in Five Minutes a Day from the library and just made the basic dough recipe last night. That’s a great decision, Michael! Please keep rambling. It’s why I come here. 🙂 I told a friend recently about your blog – “If you aren’t interested is what she has to say at first, just wait a moment and she will be talking about something else!” But truly, you always keep my interest. Thank you for coming back again and again. Aww. Nicole, thank you. That’s a sweet thing to say. (I think?) And thanks for reading! I read all the comments and not one person made this bread. I have all the ingredients, but I also wonder about the one rising. I don’t have a mixer, so everything will be done by hand. And a big wooden spoon. I made this recipe countless times for farmer’s market, but I did use a Bosch mixer to mix it all up. I’m quite sure you could do it all by hand, though. And a second rising—if you have the time for it–would probably make it even better, texture-wise. Let me know how it turns out!